XDubai athlete JB Oneil shows us how it’s done! Challenging himself to wakeboard under these narrow bridges in Madinat Jumeirah, Dubai certainly triggers a challenge in us as well. Watch the behind the scenes on how filming a unique adventure is an adventure itself. How Far Can 800 AED Take You? Comparisons don’t have to be serious! They can be humorous as proven to us in this Tajawal ad by Misfits ad agency. Ever find yourself rethinking your choices at breakfast? Yes? Then this asd is relatable to you. Here’s how to tell a compelling story through time and space with Rob Withworth. A BAFTA winning and an Emmy nominated film maker. Through Rob’s lens we see Dubai like never before, empowered to tell a tale of a city from desert to steel, integrating Dubai’s new iconic monuments with its most humble beginnings. My first impressions of Dubai were consumed with the spectacle of super tall buildings jutting out of the desert sands, however the lasting impression was the wonder of the desert, and its importance to the Emirati people. Dubai may be home to the world's most outrageous skyline but Dubai's desert dunes and historical creek are where you'll find the city's heart. FILM PRODUCTION IN DUBAI. WHERE TO SHOOT? Number one on our list is no surprise here, the Burj al Arab is no stranger to media and film production, since its inception in 1999 its been covered globally for its extravagant amenities. Everyone from Royalty to Hollywood celebrities have chosen this 7 star hotel to enjoy their stay. If you're looking to film in on of Dubai's most luxurious landmarks, then look no further then the Burj al Arab and its unique helipad for awesome stunts and shots. The iconic jewel, the Burj Khalifa is known globally for being the tallest building in the world, Think outside the box, everything from 24 karat chocolates to champaign flying fountains, this venue can make the impossible possible. The venue is state of the art with every technological amenity you could imagine and if you'e looking for the ultimate views for your shoot the Burj Khalifa is impossible to beat, at 828 m (2,717 ft) its as close to space you're going to get without being strapped to wings. During the inception of the world famous Palm Jumeirah, the developers Nakheel wanted a treasure at the end of the Palm road; a hotel for all the world to love. Well, with the Atlantis's great success in the Bahamas it was no wonder they chose the Atlantis to fill that spot. Since its opening in 2008 its been a favorite amongst the wealthiest of visitors. Everyone from A list musicians to members of the Forbes 100 have brought their families to stay within the themed walls. From underwater restaurants to 5 star shopping this hotel has it all. If you're looking for beautiful indoor and outdoor locations this is hotel is as unique as they come. 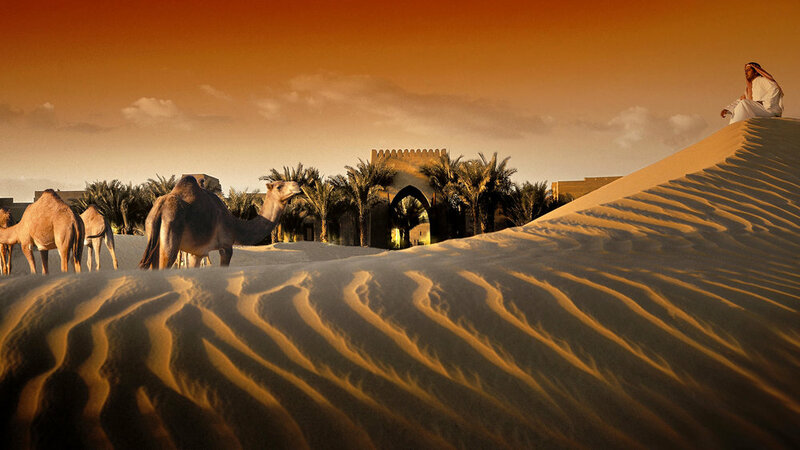 A fort in the middle of a desert, yet surrounded by an oasis creating a historical and romantic ambience at once. This gem draws the attention of those looking for a retreat, a getaway, it's simply an escape from the city and into desert's nature. The night time is magical, from a Bedouin experience to star gazing, this hotel is the perfect set up it for you when it comes to a luxurious desert film. Whether you're filming a period piece or a Syriana-esque production, look no further than this golden desert. You'll find it all at Downtown Dubai, the Luxurious boutiques, the high-end restaurants, the largest mall, the tallest building, the decorative street lights, theres nothing this promenade cannot offer. Whether you want to film in day light around the fountain or at night around the opera house, Downtown is a place you want to shoot. If you're looking for the most luxurious spots all in the same area, you won't be disappointed by choosing Downtown as your next backdrop. As most services' companies know, working with both marketing and procurement can almost seam like working with completely different clients. Some of this frustration comes from a lack of communication between the two teams, below are a few tips for our Marketing and Procurement friends. Try to understand eachothers goals; yes seriously. I'm not saying the two teams need a kumbaya moment to get this but its important to understand from the objectives from the get-go. Make sure you agree which areas procurement can bring value to your agency relationships, prioritise them and you’ll have a knockout year together. Next, you should have a discussion about what success looks like. Once you both have the same understanding of adding value (see no.1), there should be a discussion on specific areas where your departments can help improve brand performance. Done correctly, this should not only be a ‘load off’ but even be a breath of new life in your relationship. Share your pain points: a decent Procurement Manager will interview representatives of the marketing team when he/she begins the new role, and this should be part of the discussion. Think about which common issues affect you and the marketing team working effectively. Areas like ordering, lead times, approval processes, repeated or unnecessary meetings, sloppy/late/unnecessary reports, unintelligible production quotes and unconstructive feedback are all often troublesome areas that come to light. Let them help you structure and formalise the agency relationship in areas such as KPIs, Performance Reviews (and incentives), pricing and getting a robust contract in place. Relationship and financial audits too. Get a basic understanding of what each team is focusing on, this will help you get a better grasp of each-other's responsibilities and objectives. Early involvement: a common gripe from procurement’s stakeholders is that, as a gatekeeper or approver, they block or delay projects; procurement (by the same token) often complains of a lack of rigour in the marketer’s engagement of agencies. Early involvement – at the planning stage – helps assure a smooth path forward. Some of the most successful interactions between marketing, procurement and agency are open and early. Procurement can help, of course, with structure in the commercial relationship, but playing ‘good cop/bad cop’ has limited value in what should be a win-win partnership; procurement professionals have different negotiation styles for different situations. Get procurement involved in the marketing team. If you involve your procurement contacts in training or regular marketing team updates, they’ll be up to speed on Marketing’s priority activities, values and language, and less likely to be a blocker. Procurement may have an interesting overview, internally and externally. While you’re head down, poring over your brand values, agency proposals and executions, reach out to them and ask their opinions on agencies. They'll not only appreciate you showing them that their voice matters but it will make the collective work load much more enjoyable. On the occasions where the agency relationship is beyond rescue, procurement is there too to help marketing end the existing relationship smoothly, search for a new agency and lend structure and discipline to the process of bringing them into the roster. Give these a try teams! It will not only make your work environments a lot more enjoyable but will give the agencies a much more enjoyable time too! As the famous Seth Godin says: Be the Purple Cow. So whats that mean exactly? Imagine driving down a road where every home was painted white and there was just one painted hot pink. Which house would capture the most attention on the block? It goes without saying that the homeowners at the pink house wanted to grab some of your eyeball time. So why is this important in business? As entrepreneurs, it's your job to not only provide value but also sell that value to your customers. If you don't stand out how will others find you amongst the rest? Remember your company is your world and you're free to create that world anyway you like. Here are a few tips to help you stand out. Find your niche and then find the customer base that's within your target market. Example: Atum's niche is large Brands and Government clients who look for high-endvideo production services. We not only produce content, but teach our clients how to market that content effectively to reach their ROI. Focus on your unique value prop, your customers need to know what makes you different. Example: Atum's Film Production caters to Brands and Government Videos that want that fun, creative, and professional flair that millennials crave. Express with Color, get creative and A-B test your marketing collateral's design. Example: We will repurpose existing campaign content and recreate it for our clients to WOW them and close future deals. Take your craft seriously and relay how serious you are about what you do. Listen to your customers, a lot of your competitors overlook this crucial point. Example: Ask your clients for feedback. Whether it be existing content you've created or a pitch you lost, ask them why. Find things that are "just not done" in your industry, and then go ahead and do them. Differentiate your customers. Find the group that's most profitable. Find the group that's most likely to influence other customers. Figure out how to develop for, advertise to, or reward either group. Ignore the rest. Cater to the customers you would choose if you could choose your customers. Explore the limits. If there's a limit, you should (must) test it. Whether thats the cheapest, best, fastest, most secure, whatever it is take it to the max. 3 Tips for Fun & Work - Who Knew? At the end of the day, we’re creating value through engaging content, not invading Rome. We were built on our love & passion for storytelling and people. What’s not to love about that? Atum was created for fun. While we’re shaking up the digital content sector we’re giving it a taste of awe, a taste of whoa, a taste the people haven’t experienced before. We have a core belief and that is if you aren’t having fun at Atum maybe it’s time to either rethink what you’re doing or maybe it’s time to communicate. Entertainment and video enables fun, it gets us out of our shells and allows us to view the world in so many different ways. We share funny clips internally, attend comedy shows, art festivals and retreats all in the name of fun, and in return, we not only end up enjoying the work but end up boosting our productivity by making the workplace an enjoyable one. Get out of town, away from any reminders of work. This is such a great way to get your whole team to bond and build deeper relationships. We recently took a retreat to Burning Man this year which was an unforgettable experience. Not only did we have the chance to explore the beauties and wonders of the playa, but we were able to network, attend creative lectures, and build relationships on a global scale you can't normally find in the office. We all crave certain things whether that's validation or just to be heard, but it’s hard to guess what a person is thinking so its imperative that your team knows that they can express themselves and are free to communicate their ideas. Believe it or not, this makes your work environment a more enjoyable, fun and creative space. Whether you take an hour off to do office karaoke or even just to meditate, taking breaks together or alone to get your mind off of work is an essential part of the day. Try moving to a different desk or coffee shop to stimulate ideas. It works wonders for us. Try those 3 things and remember that life isn't that serious. Enjoy! Late payments across the board are on the rise in Dubai and the UAE which is putting strain on not just production companies but almost every sector which is inhibiting their ability to finish projects, hire and expand. A major factor causing this to happen is liquidity tightening up due to falling oil prices. Why is this important... Well in a region where oil is the economy's main export, oil prices falling means everyone pays the price. 2016 and the first half of 2017 have been tumultuous year's for trade and because of that companies are having to wait twice as long for payments compared to the year earlier. According to Credit Insurer, Coface - this past year has seen; Construction companies waiting 123 days longer that the contracted payment schedule. General trading delaying payments by 47 days and the food sector by 34 days. They've also reported that approx 800 companies in Dubai alone have been flagged as "runaways" fleeing the country due to not being able to pay their debts. So what does this mean for production companies in Dubai? Well the ripple effect is real, both the agency & client side have been tightening budgets, looking for lower cost solutions and delaying compensation for as long as possible. Overall the industry is going through a rocky phase just as we've seen before, such as during the real estate crash of 2008. Solution? Escrow is one, knowing your money is ready and will be paid on time is a key to growth and mitigating risk for both the contractor and client. The trick is to find a client willing to hold their money in escrow as the project is commenced. Incentives are another, such as; tier'd discount's for the client based on an early payment schedule. For example if you are to receive payment before the due date the client receive's an incentive. If your margins are healthy this should definitely be a consideration for all contractors alike. Lastly in an economy basing its livelihood on primitive technology such as fossil fuels, maybe its best that this "next generation economy" start looking toward the future at alternate energy sources as primary export, it could be the solution to not just the overall global climate problem but it might just cause a harmonious flow and balance of payments, I'm sure all contractors would just love that :) Is the sun our answer to cash flow harmony? Possibly a form of centralized blockchain all clients must abide to that works in tandem with Government regulation? Dubai and the UAE have established themselves as prime filming destination's for local, regional and international productions. From beautiful landscapes to modern architecture, the backdrop this region has to offer is unlike any other in the world. 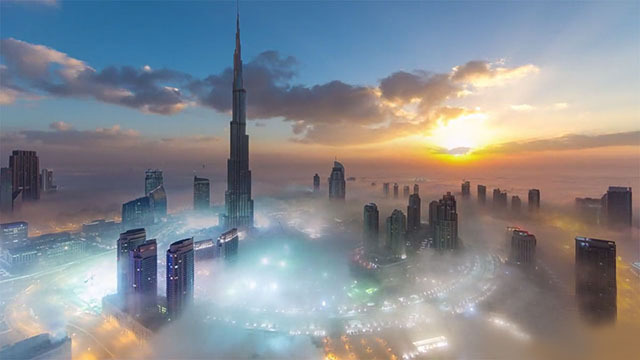 Memorizing beauty both inside and out its no mystery why Dubai has become a media Mecca to film and an ever growing metropolis for creatives to come and whip up their cinematic magic. Dubai is no stranger to filmmaking, with over 6,000 productions completed since 2005. From blockbuster feature films Mission Impossible 4: Ghost Protocol and Syriana, to TV series such as Amazing Race and Heber Al Eyoon, and to award-winning commercials and corporate videos like the ones that we at Atum, a leading Dubai Production Company produce. With its limitless locations, deep production talent pool, state-of-the-art soundstages, a supportive government and a knowledgeable film and TV commission, Dubai is a can’t miss filming destination which is evolving by the day, not even Google Maps can keep up with the ever-changing streets and monuments. Dubai has consistently been an important production base for local and international filmmakers alike. Notable successes include: Mission Impossible 4: Ghost Protocol (film, United States), City of Life (film, United Arab Emirates), Syriana (film, United States), Switch (film, China), Do KNot Disturb (film, India), Main Aur Mrs. Khanna (film, India), Casanova (film, India), Amazing Race (TV reality show, United States), X Factor (TV reality show, United Kingdom), Hebr Al Eyoon (TV drama, United Arab Emirates). While Dubai and the UAE have made great strides in the mega media industry with big names filming here, it's still a young industry with lots to learn and in definite need of more knowledgable professionals voicing their opinions, creating initiatives, giving workshops, providing social media tips, and really creating a true grass roots movement. While its easy for the big boys to come in and play its the little guy, the startup, its those guys that will really create homegrown heroes which is what the region needs if its going to be more than a backdrop but a powerhouse for creativity. Heres to many more creative productions being shot in the region and to local names becoming globally recognized.